is considered one of the most talented portrait Artist in Quebec. Born in Montreal in 1958. 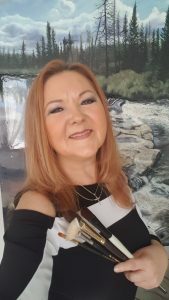 She is a self-taught Artist, she has been painting since the age of 9 and she received he first order for a portrait at 12 years old, a Portrait artist was born. For me it is a passion and especially a great privilege to reproduce life this way. Graduated in Arts at Collège Lionel-Groulx in Ste-Thérèse, 1978. UQAM. Painting and drawing, 1979. Living model workshops. 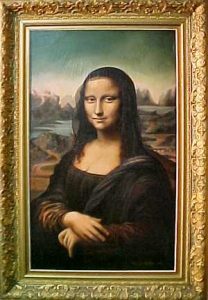 Muralist, sculptor (bronze), enamelling artist, illustrator for books and advertising house, animal painter, realistic portraits painted according to the technique of master painters. Charcoal, pastel, oil, acrylic and clay for modelling. Professor of drawing, pastel and oil painting. 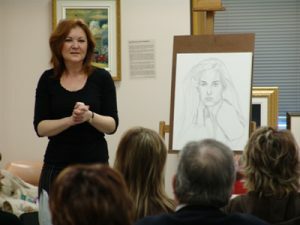 * Guest artist for conference and portrait demonstration in Canada and the United States. The artist can reconstruct characters from old black and white photos and paint them in realistic colours. 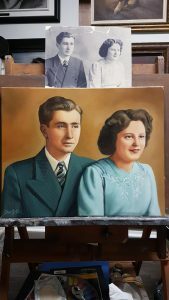 The artist generally paints from photographs and can include variations and changes of clothing , hairstyle, background, colour enhancement, slight rejuvenation of the character, etc. for the client. * Luigi Liberatore of Elmag inc.
Diane Bérubé’s portraits can be found in Japan, Spain, Switzerland, Holland, France, England, Lebanon, the United States and throughout Canada. Author’s book Mem Mehmet (2007, England) entitled Diana In Art, Book The Mayors of Terrebonne by Aimé Despatis, 60 paintings in all (2008), Authors’ book Pierre Bruneau and Léandre Normand published by Éditions de l’Homme entitled , Les légendes du Canadien (Nov. 2009).